Autism is usually not detectable in small children until about the age of three. For the developers at Cognoa, changing that detection time period is a major goal since it can often mean the difference between intervention and a lot of missed education. 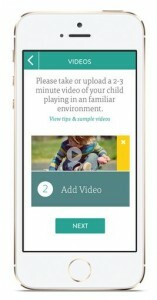 Cognoa’s is a prediction and evaluation app for parents. It relies on parents to answer questions about their infant behavior. Then, it couples that information with recorded activities of their child to determine whether small children are at-risk for autism. The app’s evaluation criteria uses medical research from Dr. Dennis Wall, Associate Professor of Pediatrics and Psychiatry at the Stanford University School of Medicine. Dr. Wall’s statistical approach is useful because parents can detect the probably and risk of their child developing autism, not just detect it once it’s too late. The app has shown an accuracy of over 90% in at least 20,000 evaluations. This is very promising since autism spectrum disorder is a chance of 1 in 68 American children.